SIAH2 antibody LS-C141889 is an unconjugated mouse monoclonal antibody to SIAH2 from human, drosophila and pig. 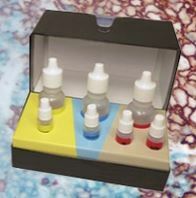 Validated for Flow, ICC, IF and IHC. Human SIAH2 and Drosophila SINA in proliferating cells and stem cells. This does not detect Drosophila SINAH or normal, nondividing cells. Staining of SIAH in human colorectal adenocarcinoma. 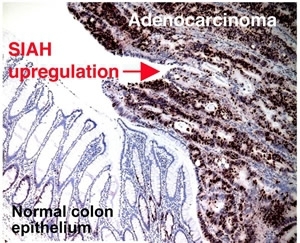 Staining of SIAH was not observed in normal colon epithelium. 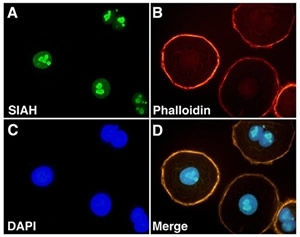 SIAH2 Antibody (24E6H3) - Immunofluorescent staining of SIAH in ovarian carcinoma (OVCR3)cells.